The steel-grey waters of the Drake Passage stretch ominously out from the chilly, windblown harbour of Ushuaia; beyond that, the Southern Ocean roils and raves on the desolate coast of our planets’ most southerly landmass. I have arrived to the self-styled ‘End of the World,’ the Argentine city of 30,000 known as Ushuaia. It’s a likable enough place, situated on the southerly end of the Isla Grande de Tierra del Fuego, with a quaint downtown area framed pleasingly by glacier-capped mountains. As predicted, gaggles of tourists dressed in immaculate North Face winter clothing wander haplessly around this austral city, clutching frantically at their battered copies of ‘Lonely Planet’ (South America on a Shoestring…as if such a thing were possible). They leaf desperately through its dog-eared pages, searching for the Top Rated! hostels, the Five Star! restaurants, the Great Value! tours. I stand on Ushuaia’s windy streets, snowy despite the fact that this is near the end of the southern spring, with summer just around the corner. I have no Lonely Planet, nor any guidebook for that matter, though I do have a wizened old copy of Rudyard Kipling’s Kim stuffed hastily in one of the cargo pockets of my camouflaged Bolivian military pants, a lender from the local library. My winter clothing is not name-brand, but it is special to me and keeps me warm: a llama fur poncho from Bolivia; a windbreaker jacket given to me as a gift from a Chilean family who loves me like their own; a woolen scarf from a dear friend in Mexico, worn both on my head and around my neck. My leather lace-up boots from La Paz protect my feet and keep them warm, and under them are two pairs of woolen alpaca socks, a well-wishing gift from a charitable Peruvian in the frigid Altiplano of the Southeast. I am not staying in the Top Rated! hostels; my current lodgings are inside an empty plus-sized shipping container owned by the German freighter giant Hamburg Süd (for bulky or high-gauge cargo of all types! announces the sticker on the interior proudly in English, Spanish, Portuguese, and German), stacked five high in a maze on the eastern industrial side of Ushuaia. I do not eat in the Five Star! restaurants, though I have ventured inside a few times in order to find hot water for my twice-a-day meal of coffee and increasingly stale bread (I am usually given the same type of look reserved for a mange-ridden cur caught digging through the garbage or a sizable chunk of bubble gum found stuck quite firmly to the sole of one’s new leak-proof Martins). I do not take the Great Value! tours; my tours are of my own making, and may or may not come to pass in the near future. The ever-present frigid wind whistles eerily through the streets of the most southerly city in the world; the weather alternates every five minutes between snow, rain, sleet, hail, and sunny skies. The sun, when visible, hangs two-thirds of the way to the western horizon, though the hour is late (nearly nine p.m.); days start early in the extreme south this time of year, and end late. Despite all this, I remain in high spirits; I have talked with the Argentine Science Foundation, who has promised to inform me by email when any Antarctic-bound foreign research vessels arrive to Ushuaia (including, excitingly, the Calypso II, daughter vessel of the late and much-revered French oceanographer Jacques Cousteau, due to arrive sometime this December). I shall also soon make a trip roughly 150 kilometres to the west to the Chilean port of Punta Arenas, for it is rumored that Russian vessels sometimes depart by sea to the Russkov Station on the coast of East Antarctica, though it is also rumored that this station has been closed down. In addition to this, a number of other vessels also depart to the Peninsula from Punta Arenas. While I may be able to reach the Peninsula from here in Southern Patagonia, arriving to my ultimate goal, (the South Pole), remains almost further away than ever before; it seems the gateway to the Pole (the U.S. Research Station McMurdo on Ross Island, perpetually frozen into the Ross Ice Shelf), is virtually inaccessible from this part of the world. Nearly all flights and ships to the McMurdo depart not from South America, but from Chirstchurch, New Zealand. Due to this information, I have also begun looking for some way to New Zealand. This may actually be easier than one might imagine: the harbour of Ushuaia is crammed with Australian and Kiwi sailors; some are adventurers here to round Cape Horn, a difficult feat, very important and much-revered in the sailing subculture. Others are simply here to avoid paying the fee necessary to traverse the Panama Canal by slipping quietly through the nearby Strait of Magellan, on their way home from sailing the seas of the Mediterranean or Caribbean. In any case, my chances of finding a ride to New Zealand and then to the McMurdo are proportionately higher than getting first to the Peninsula and then across 2,000 miles of frozen sea and windy ice-fields to the Station. Additionally, most vessels departing from southern Patagonia are Argentine, Chilean, or of other nationalities; most vessels taking to the Southern Ocean from Christchurch are of my own blood: The United States. I feel my chances are a little better with them than with the military of, say, Russia, who can be seen stalking darkly around the harbour about a kilometre offshore even as I write. Leaving Quinahue el Boldal was difficult, not because the hitchhiking was poor, but because of the people I had to leave behind. Marcello and his little family, combined with the full force of my self-dubbed mamita Chilena and other assorted relations came in a crushing wave of friendliness to bid me farewell and wish me luck on my austral adventures. Gifts of food and warm clothing were thrust upon me (“I don’t want my son to freeze to death,” said my mamita Chilena breezily as she piled three sweaters, two pairs of thick socks, a beanie cap, two pairs of long underwear, an extra scarf, and a windbreaker jacket into my arms). I left them my hammock as my token of gratitude, with a promise to swap my warm clothes for it once I returned (they wouldn’t hear of it, and insisted the clothes were mine forever. However, the hammock was accepted, and before I left I noticed one of the older uncles already had it hung between two trees and was snoring peacefully in the shade, with an old shaggy dog following his example beneath him. Same age, same habits, species notwithstanding). I walked briskly through the Chilean countryside, departing from Jorge’s house after several score hugs and well-wishes from the family around nine o’clock. A ride came after about an hour when I was halfway to the town of Chepica, and I was taken the distance back to the Pan American Highway, south of San Fernando and north of Curico. The day dragged slowly by; the hitchhiking wasn’t particularly good that morning. After a full day riding with David, my only lift of the day who was a deliverer of engine lubricant, (very friendly, but rather repetitive and leering at times: “Have you SEEN those WOMEN in BRAZIL? I mean, DAMN!” was an example of a typical conversation with David), I found myself midway between Los Angeles and Temuco at nightfall. I camped in some wood chippings behind one of the gas stations and continued south early the next morning. The hitching continued to be terrible; by nightfall that evening I had only managed to get about 350 kilometres to Osorno. This, however, was my last stop on the Chilean Pan-American Highway; the next morning I was to head east to Bariloche, Argentina through the international and literal mountain pass Cardenal. After more camping in some damp but soft moss in the wood behind a metalworking shop, I headed for Argentina just after sunrise. Since I was in the south of Chile, it was of course, raining. This was the third time I had passed through Osorno in my life, and, like every other time I had been here, the sky was busily attempting to flood the Earth with sheet after sheet of soaking precipitation. As I stood dripping in the downpour local birds and other wildlife took no notice, frolicking joyfully in the wet whilst cars heartlessly passed me by, apparently altogether unwilling to take a wet man in a lama poncho into their cars for a hundred-click ride to the Argentine border. By midday I had made it closer, at least, and found myself quite isolated on the road (which had by now become quite mountainous), about twenty kilometres from Argentina. In the altitude the rain had turned to snow, and, already thoroughly drenched from my previous long waits in the lower altitudes, I became freezing cold as well. The occasional Chilean trucker passed by without a second glance, and the Argentine cars didn’t even bother themselves with a first one. By two-thirty, I was becoming decidedly annoyed. What kind of person sees a soaking man standing in heavy snowfall asking for a ride twenty measly kilometres to the east and just keeps on driving, regardless of the fact that they are the only person in a car that which has five seats? I did not know what kind of person did that, but I was certain that they were not the type that I wanted to meet. A great man once said, ‘The good thing about hitchhiking is that the assholes always drive right on by.’ With this thought in my mind, I let the passing cars motor up into the forested mountains without muttering obscenities of any language at them from under my breath; my ride would eventually come. It always did. ‘Nice to meet you Juan, I’m Patrick.’ I said my name with the typical Spanish accent, like Patreek, for South Americans rarely understand what I say if I use the English accent. Juan took my proffered hand and pumped it in a firm but friendly way between shifting the gears of the mammoth truck. ‘I was just there yesterday. They have glass windows above the highway,’ I said knowledgably. Here was a delicate situation: Punta Arenas was not very far at all from Ushuaia, only about 160 kilometres. If I could get Juan to agree to take me to Punta Arenas, I would save lots of time that would have otherwise been spent plodding my way down through Argentine Patagonia, a place with a well-known reputation for long-wait hitchhiking. If Juan took me to Punta Arenas, I could be in Ushuaia before the eighth of November, two days before my predicted arrival time. I needed to choose my words carefully; Juan seemed like a very nice guy, and if I said the right things then I could be in Tierra del Fuego in nothing flat. ‘I’m not going to Argentina,’ said I offhandedly. ‘Well, not ultimately,’ I added hastily as we passed the sign that said, “Frontera Argentina 15 km“. ‘I’m going to Punta Arenas as well.’ This was true, because I did intend to visit Punta Arenas at some point after Ushuaia. Perhaps I would even try there first, if Juan decided to take me with him. He looked up from the snowy road for a moment. ‘To Punta Arenas?’ He gave a little wince, and said, ‘I am sorry, Patreek, but that I cannot do.’ He fumbled around in his dashboard for a moment, and pulled out a sheet of paper, an official document of some kind. He pointed to some scribbles. ‘What?’ I asked, excited. Perhaps I was going to Punta Arenas after all! I assured Juan I would be of a good distance from the checkpoint by the time he finished his paperwork; grabbing my pack, I headed off, the slushy ice crunching beneath my boots as Juan chugged off ahead. I took care of all the required paperwork at the border and walked into the ‘no man’s land’ between the respective checkpoints of Chile and Argentina. After about fifteen minutes of a fast-paced gait on my part, I heard the sound of Juan’s truck grinding through its gears on its slow way up the mountain. When he saw me, Juan stopped and picked me up, as promised. We rode to the Argentine checkpoint and repeated the process, and, after about an hour of walking in the Argentine Republic, Juan came once again rolling by and picked me up, just as he said he would. As we rolled out of the mountains and towards Bariloche, Juan and I began to talk and found that we got along quite well. He was eager to learn about the United States (“Unayyye Stayyyy!”), and loved my harmonica playing. I assured him that, with a bit of practice, he would be able to pick it up in no time. I promised to give him a lesson after we stopped for the evening. As we drove on into the Patagonian night with Bariloche fading behind us and El Bolson on the horizon, I asked Juan to teach me some songs in Spanish. ‘I’m not Ray Charles myself,’ I said assuredly. Pero yo te dejo, con mi corazon! Por ti, Li Li Marlin! For you, Li Li Marlin! Chug! Chug! Get drunk, and sleep. This was continued for each month of the year, and when your month was mentioned you must ‘rise to your feet, and, abiding by the song, chug your drink away!’ chuckled Juan. After we had sung ourselves hoarse into the wee hours of the morning, Juan suggested that I write a harmonica accompaniment for some of the songs. I, in my slightly drunken state of mind that comes when one does not sleep for long into the night, viewed this as a stroke of deep genius on Juan’s part. I tooted away on my harmonica for a moment, found a few fitting notes in the right key, and told Juan to fire away. I started my line of notes while Juan gruffly belted out the words of ‘Li Li Marlin.’ We weren’t able to get past aya la aucencia, augmentaré before the hilarity of our off-tune squeaks and croaks caused us to fall into fits of tired, delirious laughter. I could scarcely believe it; never had a ride with a trucker gone so quickly. Juan was one of a kind, to be sure. Slowing the big rig, Juan pulled into the station, killed the motor, and stood up out of his seat to stretch his back. Juan climbed up behind the seats of the cab and unbuckled the top bunk of the sleeper beds, which fell down into its slots with a metallic clink. ‘You may sleep on the top, while I rest down below.’ He stretched, took off his shoes, and collapsed in a heap in the small space of the bottom bunk. Before I could even remove my boots he was fast asleep, the gentle, even sounds of his snoring reverberating hollowly throughout the cab. I soon followed. I groggily rolled over and reluctantly came out of the warm cocoon of my sleeping bag as Juan twisted the ignition. The big engine thundered to life, and we were rolling once more through the windy Patagonian plains before I had gotten my boots back on. The day passed; we slid smoothly by the vast, grassy plains for hours and hours. One does not know the meaning of the word ‘endless’ until one travels by land through Patagonia; apart from the road, the monotony of tan grasses dominates the vision for as far as the human eye can possibly hope to see. There is no way of knowing whether the grasses come to an end just at the threshold of human vision or simply go on forever, stretching eternally into infinite oblivion. Every once in awhile we would pass a few trees which would provide a break in the monotony, for a moment; Juan informed me that hundreds of years ago, there had been pioneer homesteads in those places. Beist thou without work, or struggling to support thine thriving family? Fear not, O impoverished Peasant, for the Spanish Crown has thy solution! Her Majesty Queen Maria invites all thee whom find it agreeable in thine hearts to serve Her by colonizing those Imperial Territories of the Spanish Crown in the fruitful, exciting lands of America! These Loyal Servants of Her Most Highness shall be rewarded with no less than 10,000 ko’s of Prime Farmland, Five Hardy Mules of the Finest Quality, and the Unfaltering Blessing of Her Mightiness The Queen, as well as thy patriotic satisfaction of keeping the most unwashed of Portuguese sons of swine off the Rightful Territory of the Most Highest and Powerful Nation of Spain. Interested Parties should contact the Office of Colonial Affairs on Avenida Maria before the New Year of 1615. Gypsies Need Not Apply!!! Six months later, after a two-month boat ride (during which little Antoinetta tragically died of cholera), the farmer arrives triumphantly to the fabled land of America. It’s an incomprehensibly vast and untamed wilderness; overwhelmed, the simple man genuflects several times and swears quietly in the Name of the Most Holy Mother of God. Off the ship roll the wagons full of their supplies, their five hardy mules (“…as promised!” points out the enclosed letter cheerfully), and the map to the general location of his new homestead. In high spirits, the farmer and his family set off into the unknown, covered wagons clanking cheerfully along into the mysterious West. To be read only upon arrival!!!! screamed the front page. Due to seriousness that four exclamation marks carried in those days, the farmer was careful to do as he was told. Welcome to Spanish America, O loyal settler of New Spain! We the Most Stately Administration of the Spanish Crown trust that thee hast receiveth thy mules and thy cargo-wagons, as promised! and in an acceptable condition after the rigors of sea-travel. Enclosed is the location of thy future prosperous farmland…! Enjoy thy life in New Spain, and thou must rememberest: PPS! Piss on the Portuguese swine! Scan the Horizon for Savages! Years have since passed since the happy times of the farmer’s first arrival to the New World; years of hardship, hunger, and misery. To start anew indeed, thinks the now-old man bitterly as he sits alone in his empty home during another harsh Patagonian winter. I haveth not one piece of bread or venison to feed mine weakening body, nor one drop of brandy to quell my old nerves… Suddenly, unable to take it any longer, he runs from his home and into the harsh snows and icy winds, faltering in the deep drifts and rolling down a steep snow bank. Beaten at last, the old farmer screws up his face in agony and shouts to the heavens, “Thou hast forsaken me, O mine God of Nigh! I stand here in this savage, frozen land, mine Wife since two years dead from starvation, mine Children frozen in the icy snows of the winter of ’29, and mine Mules all dead by my own hand, for there be naught game to be hunted nor harvest to be reaped in this desolate land of America!” The farmer collapses to the ground in his weakness. As the cold seeps into his old bones, life finally starts to leave his withered, tortured body; he crawls to the grove of spiking Pine, planted along the edges of his modest homestead by his loving wife after their happy arrival to the homestead all those years ago, now halfway buried in the deep snow. The memory grows faint as the farmer’s mind begins to shut down. My ‘new life,’ indeed is his last conscious thought as he huddles up against the trunks, before the spark of life leaves him forever and the cold snows of Patagonia bury his frail body for the last time. The stately groves still stand today, rustling in the eternal winds of the Patagonian plains, timeless grave-markers for the long-lost settlers of old which dot the horizon of Patagonia, a warning to all who dare try and tame the Beast that is the frigid Plains. Of course, there are those that have survived; every few hundred miles we drove past a small town that managed to subsist here, isolated in the most literal sense of the word in the vast grasses, though they are forced to import their water (‘It is a strange thing,’ said Juan to me pensively, ‘it seems always to be raining in Patagonia, or snowing; yet there is no water to be had here!’ He shook his head in bewilderment. ‘Where it all goes, I do not know.’) Sometimes even mid-sized towns sprout up when there are mountains around to block some of the wind (these, I assume, are the principal reasons the town of S- has managed to remain in existence for more than a century, as the sign in the entryway so proudly states in bold letters). Patagonia is not always the vast grasslands, however. We passed great grey mountainsides which jutted regally into the blue sky, stabbing aggressively at the cotton-ball puffs of clouds which floated in vast numbers above the southern land; great mountains, forbidding canyons and gorges, scars and blemishes on this strange land. Their beauty was undeniable; but was a dark beauty, like that of witches. Meanwhile, as mystical Patagonia rolled quietly by out the window of the semi, I felt us slowing down; the air breaks hissed and we pulled over onto the shoulder of the highway. ‘Why have we stopped?’ I asked curiously. ‘Lunch,’ said Juan with a grin. I looked around; we were miles away from anything. ‘Here,’ said the trucker placidly. ‘I am going to cook for you ‘Juan’s Chilean Soup.’ I always make this when I travel through Patagonia; restaurants are few and far in between, and I don’t much care for the food in Argentina,’ he said winking. ‘Not enough onions. I like onions.’ He began unloading pots, pans, and a gas stove from a space under his seat that was apparently a lot larger than it looked. ‘This is cheaper as well,’ said Juan thriftily, and he began busily removing all the ingredients out of a medium-sized ice chest that had somehow managed to fit underneath the seat as well. ‘We’re going to cook?’ I said, bewildered. ‘But the wind is so strong outside!’ And it was; some gusts slammed into the cab with such force that the truck shook about as if in a strong earthquake. And cook we did. Soon, Juan had a potful of meat, carrots, onions, and mixed vegetables simmering on a roaring gas burner, giving the inside of the cab a pleasant odor. ‘The onions are the most important,’ said Juan as he industriously chopped a fourth and scraped it into the pot, blinking his eyes with the tart aroma that had replaced that of the soup. ‘If you don’t eat enough onions, than your stomach never gets fully emptied,’ he droned, blinking as he started chopping a fifth. ‘People who never eat any onions have all sorts of food caught in their stomachs. This way, you start afresh each time you dine.’ He scraped the fifth in, and looked up at me. ‘You know, I heard of one fellow who could not eat anything, for the amount of food that was trapped in his stomach and could not pass on…and all because the man ate no onions!’ The trucker shook his head, as if to say “what a pity,” and began chopping a sixth. ‘I don’t really like onions all that much,’ I said, wiping the tears from my eyes. ‘Then today, you like onions,’ he said, and with a grin, scraped the sixth one in. The soup steamed ominously, the meat and carrots invisible beneath Juan’s regiment of chopped stink. ‘I guess I like onions,’ said I apprehensively. Juan produced a wooden ladle from somewhere and began to stir the mess, which hissed menacingly; as if angry someone dared disturb its malignant mumble. ‘Now,’ said the trucker, businesslike, ‘you must keep stirring the soup so that it does not stick to the bottom. After five minutes (he looked at his watch) you must add that second bag of mixed vegetables over there by the bunks.’ I nodded, unable to see the phantom bag since my eyes were full with water caused by the onion funk. Juan appeared unaffected; perhaps he had developed immunity over the years. I groped around in what I thought was the general direction of the vegetable bag, wishing we could crack a window or something. Finally, after coming up with a bag of chocolate donuts, crumpled-up loose leaf notebook paper, and a bag of Smarties, I managed to locate the elusive mixed veggies. I tore open the bag with my teeth and dumped it in the pot, hoping it would repress some of the onion smell; it didn’t. ‘Perfect!’ said Juan happily. ‘And now…we wait.’ Great, I thought. ‘Can we roll down a window?’ I mumbled grumpily, still unable to see anything with clarity. Gasping, I groped for the button which would release me from my sour-scented prison; finding it, I jammed it down with my thumb and stuck my head out into the fierce Patagonian wind, taking huge gulps of the cold, clean air. ‘What a baby,’ I heard Juan mutter good-naturedly as he stirred his onions. Surprisingly, the soup turned out to be of tolerable flavour, as Juan had cooked his smelly scoundrels to the point of almost total collapse (‘To release the enzymes,’ Juan replied sagaciously after I’d asked why). I finished my bowl and used my bread to sop up as much onion juice as I dared. ‘I’m finished,’ I announced once I had scarfed the loaf. ‘Great!’ said Juan, ‘there is plenty more!’ and before I could object, he had ladled another sloppy spoonful into my valiantly empty bowl. I sighed, and resigned myself to eating it all. Food is, after all, food, and to waste it is, in my book, a great travesty …even if it is mostly pulverized onion carcasses. After we had cleaned up the cab, I was put on dish-duty. ‘I cook, you clean!’ Juan had cried reasonably (reminding me rather alarmingly of my father), and I washed the stinky dishware off in good spirits. Juan was a great man, despite his disturbing love for onions. I was lucky to have gotten picked up by such a fun person. We continued off into Patagonia, my stomach rumbling irritably with all the onions (‘Can you feel yourself becoming unburdened by all the excess food?’ asked Juan excitedly. I felt like I was about to be unburdened, all right…). We drove until the day had worn itself out and the night had returned once more, whereupon Juan declared that I must serenade him with my harmonica in order to keep him awake. ‘I’m making record time on this trip!’ he said animatedly. ‘We must drive late into the night once more!’ I extracted my mouth-organ and began obediently tooting away, but after an hour of this I began to grow tired. ‘Teach me another song in Spanish.’ I suggested. I knew just the song, one that had been gloriously stuck in my head since my magnificent train-hop in Peru: King of the Road. ‘Treell…ment?’ said Juan pathetically. Perhaps this would be more difficult than I thought. So I drilled the words into his head like a Texas oil rig going full-force into the Gulf of Mexico. ‘Tray-lurss!’ said Juan, more confidently now. I’m a man of mean…by no mean? ‘How do you say habitationes, o piso, in English? How do you say mascotas in English? ‘How do you say cigarros in English? How do you say para arender in English, both words? Juan did very well indeed, though his pronunciation perhaps needed a bit more work (‘PETS!’ I had shouted at him over and over again. ‘With an EH! PETS!’ ‘PITS!’ he would shout back at me every time). However, I was quite proud of myself, and of Juan. Perhaps I should look into teaching English as a foreign language, for something to do in a far-off city dominated by Spanish, my newest toy. By the time Juan’s English lesson was over, it was nearly five a.m.
‘It is time to sleep,’ said he, and I agreed wholeheartedly. All the hours of shouting ‘PE-EH-EH-EH-EHTS!! !’ had really taken it out of me. ‘But I shan’t remember a word of the song…’ he thought for a moment, ‘Keeng of de Ro’a’, in the morning. I shall forget it all.’ I disagreed. Juan pulled over the semi on a random side road and we collapsed into our respective beds, Juan still muttering the lines to ‘King of the Road’ under his breath as he fell asleep. The next morning, to Juan’s immense delight, he was able to remember all the words to ‘King of the Road,’ except for the word ‘for sale.’ After a quick memory jolt from me, he remembered. Juan was amazed. We laughed. 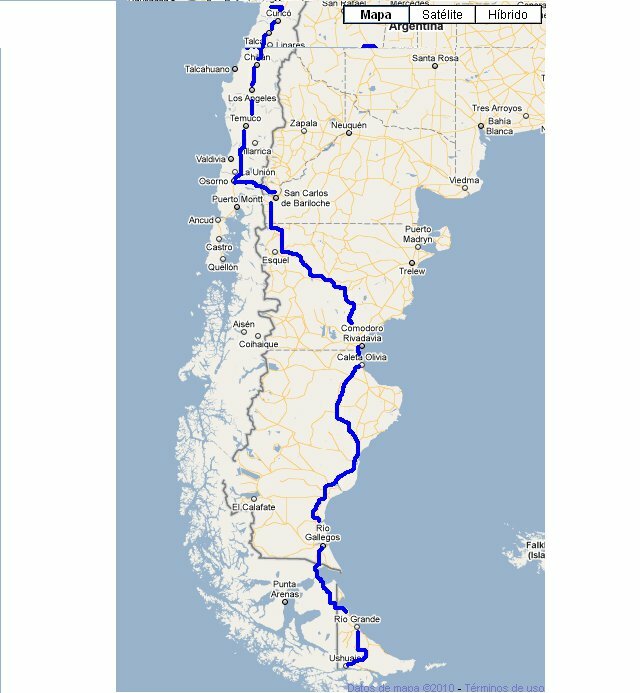 We had covered a lot of distance in the night, and were now almost to the southern border of Argentina and Chile, so close to Tierra del Fuego that one with a strong arm could throw a stone into the Strait of Magellen. When we arrived at the border crossing it was time for me to get out and walk once more. I wrote down the words to ‘King of the Road’ and my contact information on a napkin for Juan in case we got separated. ‘This way you will never forget,’ I told him as he took the napkin, storing it reverently away in his wallet. This border was like most others I had passed: an official-looking building which congested the flow of traffic on an otherwise clear road. Semis, buses, and personal vehicles were parked all around as their occupants went inside to perform the necessary ritual of Immigration and Customs. I went inside, Passport at the ready, anticipating an easy crossing. I went up to the Immigration desk, got my Passport stamp, and then went over to the Argentine Customs desk, manned by a fat man wearing thin spectacles. ‘Please put your bag onto the belt of the X-ray machine,’ he said boredly from behind his rims. I did so, and he jammed a red button with his fat finger. Nothing happened. He tried again; nothing. The sausage banged the button over and over again in its frustration. The customs man sighed. ‘Not again…okay, please put your bag on that table over there.’ I did as I was told. ‘Plant or animal products?’ he sighed out. ‘All right then.’ He pulled my bag over to him and began going through the pockets with his thick fingers. After a moment, he seemed satisfied. ‘All right, now I need you to turn out your pockets.’ I did so. Finally, he finished unrolling it. I noticed with huge relief that there were no stray nuggets in there. I and my mates are usually very thorough, after all. The fat customs man looked up at me. He stared severely at me from behind his tiny spectacles. He then appeared to realize that, at any moment, he may have to get up from his chair, and seemed distracted for a bit with the gloominess of this impending strenuous activity. He sighed. ‘Wait here for a moment,’ and, after many pathetic grunts and grumbles, managed to free his tremendous rear from the plastic lawn-chair, who looked immensely relived, for a chair. I waited and twiddled my thumbs, not extremely concerned. They can’t arrest one for a slightly burned sheet of paper from the inside of a cigarette box and the strong odor of Woodstock, can they? I didn’t think so. The fat man returned a few minutes later with a couple of serious-looking men with military uniforms on. He sighed once more. ‘These men are going to have to check everything you have to make sure that you don’t have any small pieces of marijuana on your person,’ he said tiredly and adjusted his spectacles, which had gotten comically lopsided somewhere between when he had left me and when he came back with the serious men. ‘Please come with us,’ said one of the serious men. ‘And take your rucksack with you.’ I did as I was told, and was led into a small room in the back of the building. Soon, in came another man with a military uniform, bearing with him an intensely overexcited male Chocolate Labrador, who, upon being granted access into this room with all these people and that mysterious bag, gave his master a look of pure adoration and promptly jumped onto his shoulders and licked his face enthusiastically. ‘N-no, no.’ He pushed off the Lab, who looked, despite the rejection, in absolutely the same fanatically thrilled mood. ‘Go find the drugs, boy go find the drugs!’ said one of the military men. The Chocolate Lab barked, whapped his tail on the floor, and licked his chops. ‘Go find the drugs!’ The military men led him to my bag, and the Lab immediately stuck his nose inside, sniffed ardently for a moment, and came out with…my towel. The Lab then began to eat my towel. ‘N-no, no, don’t eat the towel,’ said one of the military men tiredly, and tried to take it away. The Lab, sensing a game of tug-of-war on the horizon, pulled passionately back, his tail whapping against my leg in his excitement. ‘Let go!’ commanded one of the military men loudly, and the Lab released his hold. Despite the firm command, the Lab still seemed distinctly elated that things were happening, and that he was the center of attention! The man tossed my towel onto the desk, and said again, ‘Go find the drugs, boy! Go find the drugs!’ The Lab eagerly returned to my bag; then, putting his front paws up onto the desk, recaptured the towel with a pleased grunt. ‘I think he needs more school,’ I said, holding back fits of laughter. ‘Shut up,’ said one of the military men. The military men took my towel out of the room. Then, again, ‘Go find the drugs, boy! Go find the drugs!’ The lab disappeared once more inside my bag and came out with…my backup towel. After that the Chocolate Lab was removed, presumably for more thorough schooling and/or biscuit rationing. We waited for a moment, and then in came the same military men, this time with a grossly overweight black lab, whom, I was told, was markedly less excited about the world and, more importantly, about towels. The Black Lab did seem very unexcited about towels…or about anything, for that matter. She came inside, looked around the room dully, and promptly lay down and went to sleep (I was reminded strongly of the fat customs man…perhaps this was his dog). The military men tried several times to rouse her (‘Find the drugs, girl, find the drugs!’), but they were completely and utterly ignored. I do believe, in that few minutes she was in there, the Lab slipped into REM sleep. She was snoring. This is why they make such great companions, I told one of the military men happily, who gave me a sour look and told me to go to Chile already. I left the room with my pack in tow. ‘I trust you want me to dispose of this?’ The fat customs man held up my paper pipe. He was back in his plastic lawn-chair, who looked very tired, for a chair. ‘Surely,’ I said, still chuckling about the Labs. And so I arrived to the extreme south of our world. The time I was delayed with the Labs caused Juan to need to leave me, due to time constraint reasons. ‘I’ll see you on Facebook, my friend! Keeng uv de Roo’a!’ he called out to me as I went into Chilean customs, and he motored off south. I grinned and waved back to my friend. Now, with Tierra del Fuego on the horizon, I could go to Ushuaia directly. I made my way to the ferry in short notice and was soon on the big ship loaded with semi trucks, motoring off towards the Isla Grande de Tierra del Fuego. A strong wind buffeted the Strait of Magellen, the salty sea air rifling my hair not with violence, it seemed, but with a caress. I sit now in the Public Library, (The End of The World Library! proudly proclaims the sign out front), enjoying their willingness to remain open for wayside wanderers like me into the wee hours of the morning in celebration of their 84th anniversary. I have been alternately perusing the poetry of Rudyard Kipling and a few works of the great Argentine writer Jorge Luis Borges, while in the back of my mind thinking hard about what I must do next to continue my Adventure as I wish it. His Sea that his being fulfills? Hillmen be silenced! I embrace the Sea, though I know it not. Ha! Might I say, I embrace the Sea, for I know it not! It is the unknown; the boundless, bottomless, endless depths of mystery unidentified, of stories long gone untold. Its watery currents stretch throughout all the crevices of all the world, carrying with them all the secrets and all the mysteries of all of mankind for all of time. No man knowest the secrets of the Sea, and no man can ever hope to know such a thing. Yet the very epitome of the aimless wanderer such as I, is that of the sunken ship; whose rotted timbers, caught in powerful undersea currents, sail timelessly throughout the inky depths, never reaching port, nor island, nor home. An eternal wanderer, doomed- or blessed? to forever drift about the seven Seas; of water, of salt; of time, and of tales. For this reason…for this reason…I wish take to the Seas. And t’ither it…do I go. Excellent Patrick. Great adventure. Great writing. You have not only courage, but also talent. Sounds like Hank got a job as a drug dog! Great writing and missed you at the LaLonde reunion. Keep us posted and how are you feeling these days? Probably your best writing yet. It took a while to read, so I can’t imagine how long it took to write! I do believe you really have the makings of a great book. I can only hope and pray that you survive to finish it. Your descriptions of the landscape are so vivid, I feel like I’ve been there. I never realized it was so desolate. Your “characters” come alive, as if I’ve met them myself. I’m so glad you are meeting such nice, funny, and interesting individuals. Most people really are nice… the rotton ones just get noticed the most. Great reading! Just curious… What is your mission, your message? Well, my mission is to learn as much as possible about everything possible, to take risks, to lose mysef in the world somewhere, and to find myself somewhere else later on. My message? Challenge yourself, take the hardest way there, explore side roads and mysterious holes in the ground, and break your boots in before you go. Very creative. The greatest thrill in life is not where you are or what you do, but being who you want to be. Your voice echoes of feeling tapped into that. :) I believe in what’s next. Go Patrick! A book would probably be nice; but I think you could work for National Geographic some day in the future. You should make a good photograph course; then, if I were the NGS CEO, I would hire you. You know, I have read some english NGs and they are really boring; they do have a lot of interesting informations and the pictures are nice. But all the information are there in a boring-wise lecture. You instead, write in an interesting way (we stay reading your experiences like if it was a very good book); and you also master the way to deal with people, which is fun reading, because each people is an interesting world apart. You have learnt the latin way to deal with people around (like spanish, italians, brazilians, mexicans etc). And this is what lacks to more than 90% of the NG’s writers. That is my opinion.